The U.S. space agency NASA with the New Media Team has released the first NASA iPhone application that enables users to stay on top of the latest NASA news. It is to deliver up-to-the-minute NASA content directly from Agency sources in one easy-to-use mobile platform. 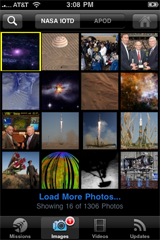 The application offers access to up-to-the-minutes news, videos, and photos from NASA missions. Users can also track the orbital locations of various NASA spacecraft in real-time. 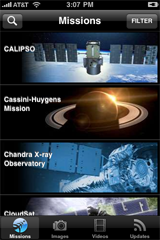 The missions home screen - shows all current NASA missions in a table view to skim. Any item in the list of missions can be selected, which opens a detailed view. The images home screen - gives the user two image gallery options, the NASA Image of the Day and the Astronomy Picture of the Day. The user clicks on an image to see a zoomed in version with the ability to read the photo description, and can toggle between the two sources. The images are displayed in thumbnail format. 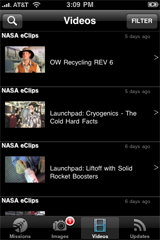 The video home screen - allows the user to browse, select and watch videos posted to YouTube by NASA. Videos are presented in a tabular format and are searchable via keywords. Users can also select from a list of YouTube channels to narrow or widen the scope of their video browsing. 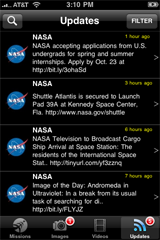 The updates home screen - displays updates from various NASA Twitter feeds. These "tweets" are searchable and the users can select from a list of NASA Twitter feeds to narrow or widen the scope of their browsing. The NASA App is available free of charge on the App Store from Apple directly to the iPhone and iPod Touch or within iTunes.